Gold hasn’t always been associated with the most modern of aesthetics. The metallic hue was once reserved for more traditional spaces, but its resurgence over the last few years will have you going ga-ga–that is, when it’s done right. No matter the space, working in a little glitz is totally doable whether you want to integrate a touch or a ton of gold in your room. Here are seven spaces inspiring us to give it a try. 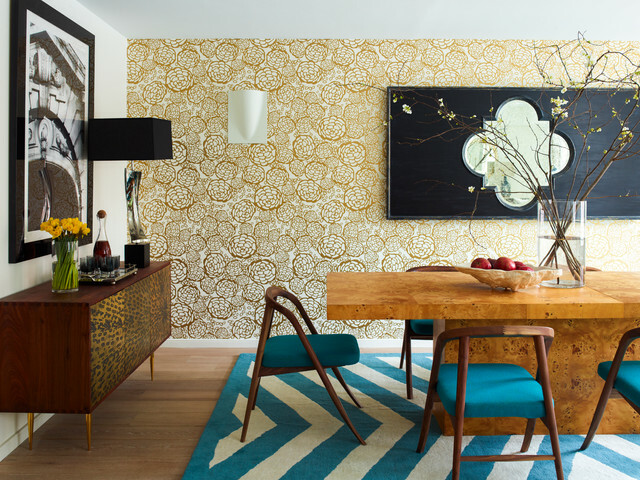 Swathing an entire room’s wall in gold is definitely a bigger commitment, but it also keeps it simple to keep the indulgence around the perimeter and dramatically draw the eyes up and around the space. The wall also reflects the sunlight coming through the large window, acting as a focal warming point that contrasts the more sparse, modern details. Free of distractions, putting the gold focal point behind the bed is the genius of these next three modern bedrooms. Let the wall behind the bed do all of the talking. Whether you use a wall treatment, curtain, headboard or large artwork, a gold installation behind where you sleep might just be the simplest option to bring in the warmth without the busyness. Plus, how happy will you feel each time you walk into this room with a statement like that looking right back at you? They key is to select something special that you won’t tire of looking at any time soon. This gorgeous view is balanced out by a glazed and golden wall behind the head board. The perfect balance of cool blue sky, greenery views and a warm glow supplemented by a single hanging pendant for nighttime reading. A dreamy combination. This large bedroom puts the emphasis again behind the head of the bed, drawing the eye up not only with color and texture, but with continuing lines of gold that spread subtly up the walls and into adjoining cabinetry. This design is a little more complicated in terms of execution, but it still keeps the room simple by balancing the light with reading orbs at the bedside and warm colored linens that carry the ambiance throughout. This modern kitchen features a giant, round fixture (Lee Broom’s Carousel Chandelier, a favorite of ours), which balances out the long expanse of horizontal cabinets behind it. The warm golden glow of the brass finish complements and balances out the cool and dark finishes found throughout the room. Look how the dining room above is perfectly proportioned. The double chandeliers (Gio Sarfatti’s Model 2097 Chandelier for FLOS) flank the painting, providing balance and a flowing focal point throughout the room and length of the table. The black and white room palette is warmed considerably by the choice of a golden finish on the fixtures and in the frame of the painting. The number of lights and their structure provide the visual interest for the room without distracting from face to face dinner conversation. Even though there’s a lot more going on in this room – the details work very well together. The gold filigree pattern on the walls ties into the curled wood branches on the table which tie into the warm wood finish of the table itself. The variety of woods present in the room from the floor, to the table, to the buffet are all different hues – but still provide the effect of cozying up inside of what can sometimes be uninviting and too formal in a dining space. This room wants to be lived in. So, now that you’ve gotten your design inspiration – don’t be afraid to ease on down the golden road. What will you do to embrace gold in your space?